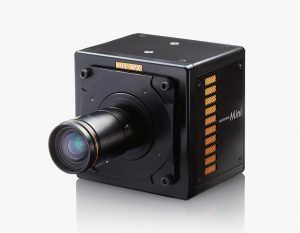 The FASTCAM Mini WX100 high-speed camera delivers exceptional high resolution imaging performance by providing 2048 x 2048 pixel resolution at 1,080fps (Mini WX50 750fps), 1920 x 1080 pixel full HD resolution at 2,000fps (Mini WX50 1,500fps) and frame rates up to 80,000fps (Mini WX50 67,500fps) at reduced image resolution. The system’s flexible Region of Interest (ROI) capability allows the user to choose an image aspect ratio appropriate for the subject being recorded. The FASTCAM Mini WX is compact, lightweight and also rugged (operationally tested to 100G, 10ms, 6-axes). This unique combination of high resolution imaging performance in a compact, lightweight and rugged package makes the system well suited to a wide range of industrial and scientific applications. It is ideally suited for biomechanics, microscopy, automotive safety testing and defense applications. The FASTCAM Mini WX utilizes Photron’s proprietary CMOS image sensor design expertise, including on-chip microlens technology to optimize light sensitivity. The camera provides broadcast quality high definition image resolution, color fidelity and dynamic range. Recording memory options from 8GB to 32GB permit the capture of over 10 seconds of uncompressed and un-interpolated data at 1,000fps with full HD image resolution. Standard operational features of the FASTCAM Mini WX include a mechanical shutter to allow remote system calibration, Gigabit Ethernet Interface for reliable system control with high-speed data transfer to PC, and the ability to switch off cooling fans to eliminate vibration when recording at high magnifications.